The resources in this FREE E-LEARNING SECTION - shared by FOSTER and OpenMinTeD projects - will help you to get started on developing a better understanding of Text Mining. You will find basic information on the steps involved in Text Mining, and the importance of Text Mining Scholarly Publications. Do you speak Text & Data Mining (TDM)? 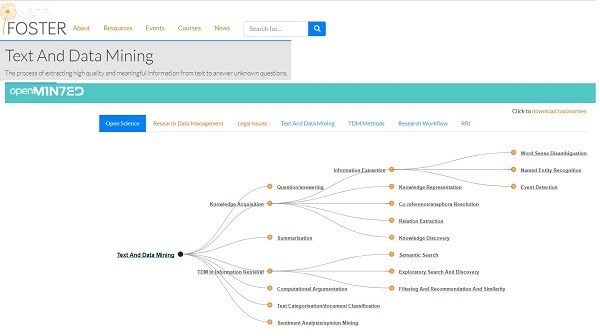 To understand the key concepts and areas of TDM, please study the Text and Data Mining taxonomy. The purpose of the taxonomy is to map the field and present the various techniques relating to TDM. Apart from that, you can click on each taxonomy term to retrieve documents, tutorials and infrastructure relating to TDM.